Wheat is Australia’s most important export to Indonesia, valued at over $1 billion dollars per year. Some of this crop is grown by local Eyre Peninsula farmers. Delivered by ship to the Port of Tanjung Priok, Jakarta, Australian wheat is the major input into Indonesia’s noodle production and export business. It serves as a means of sustaining local farmers and jobs, while also sustaining life and livelihoods for our neighbours. After living in Indonesia, I now see a field of local wheat differently than I did before. The majority of these images were taken on the streets of Jakarta, home to a diverse mix of affable and quick-to-laugh inhabitants. 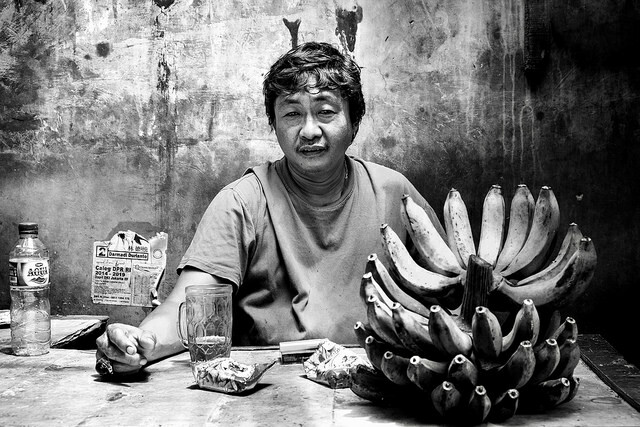 Most of these images were chosen because they penetrate the polite Indonesian veneer and expose some truly gritty and vulnerable characters, some were chosen to add balance to the selection. The decision to use monochrome helps to focus attention on individuals and removes distractions that colour can add. Using street photography techniques to catch the ‘off moment’ has countered the local inclination for exaggerated posing for a camera.